Motor controls in HVAC have evolved over the years as the demand for better use of energy while improving comfort to the users become more critical. 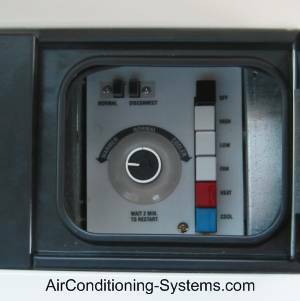 The need for more accurate control to the entire cooling or heating system has caused a simple switch, relay or contactor to control a motor speed no longer sufficient. The most complicated motor control now involved the use of DC inverter to vary the speed of a DC compressor or large DC motor based on the need of the load. The heart of the controller is the use of powerful microcontroller or microprocessor that can do fast calculation of the parameters that are fed into it. In small motors such as the permanent split capacitor(PSC) fan motor in a mechanical control window air conditioner, the speed of the fan is limited to 3-5 speeds. The speed is varied by manually switching the fan control button to its desired location. Usually the speed to be varied is Low-Med-High. These switches are suitable to be used in low current application, usually below 1A. Speed is changed by changing the winding resistance of the motor. Higher fan speed means the switch is switched in such a way that the circuit of the fan motor has lower winding resistance. When selecting the type of switches to be used in the design of the equipment, make sure that the voltage, the current and material meet or exceed the requirements of the application. A UL certified switch is necessary if you want to better market the product in the USA or Canada. Relays are used to close or open the contacts that are connected to the motor under control. The relays have a magnetic coil that can be operated using voltages such as 12V DC, 24V DC, 48V DC, 110V AC or 240V AC. Once the voltages are connected to the coils, it will close or open the contacts depending on the contact arrangement of that particular relay. The signal to control the operation of the relay is usually controlled electronically. For instance, a 12V DC relay with SPST contacts can be used to control the condenser fan which is operated by a 110V AC power supply. When the equipment requires the condenser fan to switch ON according to the input conditions of the sensors, a signal will be send to the driver of the relay which could be a transistor. This transistor will switch ON and cause a 12V DC voltage to be applied to the relay. The relay will ON and caused the SPST contacts to be connected together. One of the contacts is connected to the LIVE power supply and the other contact to the fan motor. When the two contacts are connected together, the LIVE power is connected to the fan motor which causes it to turn ON. The other end of the motor is connected to the Neutral of the power supply. Relays can switched up to 30A of motor current. Most of the time, they are used to control the fan motors of the evaporator, condenser, cooling tower motor and small capacity ON/OFF type of compressor motors. 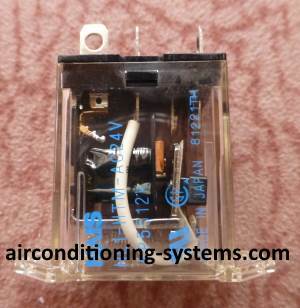 The contactors operate very much like the relay but have higher current carrying capacity. They also have coils that are operated by voltages ranging from 24V-460V AC. These contactors can switch current from a few amperes to hundreds of amperes. The control is usually done electronically where signals from the electronics are used to control them. The contacts of these contactors have more arrangement than relays. Often times, there are auxiliary contacts with lower ampere ratings but are suitable for use to switch auxiliary circuits such as lamps or small heaters. The main contacts are connected to power large compressors, three phase induction motor fans, big pumps or boilers. Starters are similar to the contactors but have the additional motor overload protection built into the starters. The components that make up the starters such as the coil, springs, overload protection heaters and switches and contacts can be changed if anyone of them is faulty. The purpose of the overload protection is to disconnect the motor from the circuit when an overload condition happens. The designer will have to take into consideration the service factor amperage or SFA when designing the value of the trip-point. See more details of service factor amperage here. The detection of overcurrent in the starter can be a bimetal element or a low-melting solder. The bimetal strip will warp when excessive heat is generated due to overcurrent. When this happens, it will stop the power to the coil circuit and disconnect the power to the motor. The melting solder also melts when an overcurrent happens to the circuit that is protecting the motor. It then interrupt the power to the coil causing the motor to stop. Reset can be done after it has cooled down by pressing the reset button. The disadvantage of the bimetal and melting solder is that they are affected by the ambient temperature. Therefore, take precaution when you install the starter. Try not to expose it to the sunlight or other sources of heat. Take note that when overload happens, do not restart the motor immediately. A problem has occurred and must be identified or else the fault will happen again. Autotransformer is used to reduce the starting voltage to the motor hence the reduction of the inrush current to the motor. The inrush or the starting current can be 7 times higher than the full load current when full power is connected to the motor. 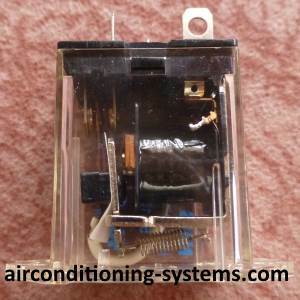 The autotransformer is connected between the starter contacts and the motor. During start-up, the autotransformer windings are connected as part of the motor. This reduces the voltage to the motor and the speed of the motor will ramp up. Once the speed stabilizes, the autotranformer will be disconnected from the circuit by using a series of contacts to achieve this. The full power will then be connected to the motor. Electronic starters or soft starters are the best control method to reduce the inrush current of motors. The electronic starter consists of semiconductor components that work together to ensure smooth starting of a motor. It slowly ramps up the speed of a motor until full speed without the inrush current hence no unnecessary stress to the components of the starter. It is small in size and is a good replacement for the autotransformer. Once the full speed is achieved, a bypass contactor is energised to continue the supply to the motor. The soft starter is then disconnected from the system electronically. When shutting down, the starter takes over the circuit and disconnect the contactor to the motor. It then slowly stop the motor by reducing the voltage to it hence ensuring a soft shutdown of the motor. Compressor motor is the main component of most air conditioning systems. Major development in electronic drives have evolved and DC inverter control is now the latest technology that is available in the market. By using this technology, the DC motor can be controlled not only during starting or stopping of the compressor but also during its operation. The frequency of the motor can be varied according to the requirements of the heating or cooling load. This technology has enabled a more efficient use of energy and better comfort to the users. DC inverter drive is here to stay and most manufacturers will be phasing in more products using this technology if they do not want to be left behind.